Software development, also known as web development, website programming, or web based application development, is a field that is powering businesses with efficient, secure, and reliable solutions through software programs or applications, to achieve outstanding business results by increasing efficiency and reducing overhead. As standard software solutions cannot fulfill the individual requirements of a business, custom software development has emerged to help businesses derive unique solutions fit for their specific needs. 6. 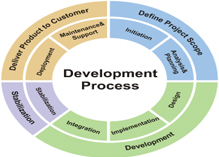 Why Valley Web Solutions for Custom Software Development? Valley Web Solutionsis a custom software development company, trusted by reputable businesses for its core expertise in developing high-performance web-based software applications. We have experience with all of the leading software technologies to build n-tier web applications for technology-based business management. Working with a precise, solution-based software application development process that is grounded in teamwork, we are able to yield qualitative customized web-based solutions for different spheres of businesses in a timely manner. Our software product development secures flexible and scalable software applications for our clients, to allow for any further development in the future. 11.Exploring software development companies that employ only expert software engineers and development architects? Valley Web Solutionsis where your ambitious web-based application project can be best accommodated.